Melissa is an Orthopedic Clinical Specialist certified by the American Board of Physical Therapy Specialties. She earned her Bachelors of Science degree in Kinesiology from the University of Massachusetts Amherst and Doctor of Physical Therapy degree from the MGH Institute of Health Professions. 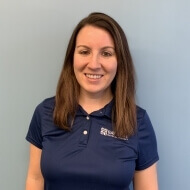 Melissa’s clinical background is primarily in outpatient orthopedics with an emphasis on manual treatment of neck and back pain. She enjoys treating a wide variety of conditions including post-surgical repairs, total joint replacements, arthritic pain, post-concussion syndrome, and pregnancy-related pain. Patient education is integrated into treatment sessions with the hope that clients may better understand their diagnosis and prevent future injury. Melissa lives with her fiancé and two cats. In her spare time she enjoys running, traveling, and spending time with friends.